I apologize for the excessive map worship, but do consider this following snippet of page grab from Google Maps. To the left is a moderately wide-angle photograph of the border between Massachusetts and New Hampshire, along a route that I drive four times weekly. From this distance, they look moderately the same, except that New Hampshire looks significantly more verdant, as if its foliage is greener than its tax-laden commonwealthy neighbor. However, since the border between the two states is imaginary and not marked by a physical or weather barrier, it seems unlikely that Massachusetts’ trees should be in such dire need of water, especially when immediately next to their lush New Hampshire brethren. The image on the right brings understanding in to sharper focus by showing just how low-fidelity the zoomed-in sattelite images for New Hampshire are. 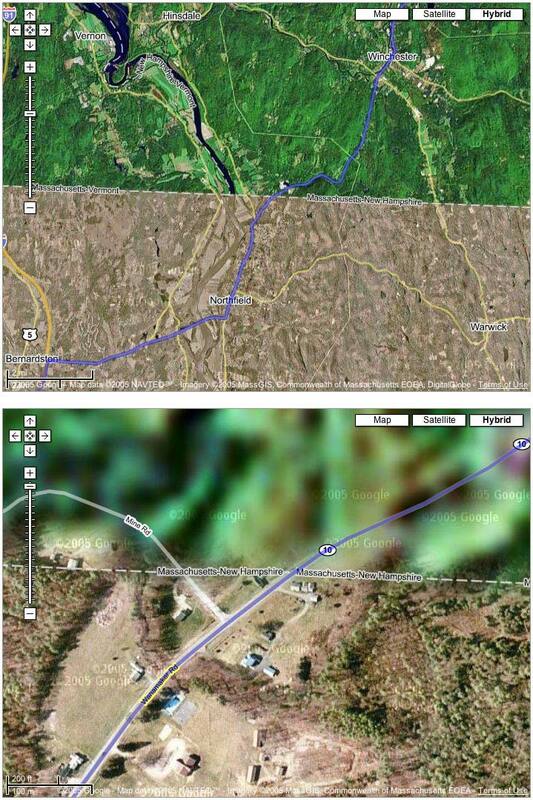 Whoever is responsible for the NH aerial imagery, namely Digital Globe, clearly isn’t providing the level of resolution acheived by the neighboring MassGIS (Geographic Information System) in collaboration with the Commonwealth of Massachusetts Exectutive Office of Environmental Affairs. How sad to live in a state that looks down its nose at its southern sibling, and thinks so highly of its environmental efforts, only to discover that that Mass’ enviromental agencies are going to be able better track erosion, weather damage, deforestation, suburban sprawl, blight, and the like with sattelite technology. Click on the above image for a larger demonstration of blurry, trippy, low-rez New Hampster.